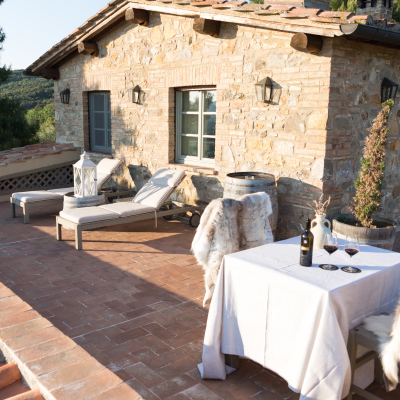 Conti di San Bonifacio can be found located in the stunning countryside of Tuscany, in Italy. 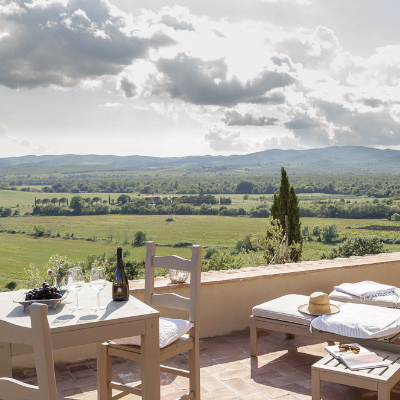 This hotel and wine resort is a fine example of everything Tuscany has to offer, from wonderful Italian hospitality to exceptional food and wine. This wasn’t our first visit to this exceptional place, and we were excited to be returning, and thrilled to see the same level of high standards had been retained. When we arrived, once again we looked around in awe at our beautiful surroundings. The views here across the Tuscan landscape are just idyllic. With the winery providing the perfect backdrop, the setting makes you instantly relax. We were greeted warmly by the team before being shown to our room, the Conti di San Bonifacio Suite. Our suite was just wonderful, being spacious and well presented. The four poster bed was a real treat, along with the comfortable sitting area at the foot of the bed. The bathroom was large and immaculate, with luxurious fixtures and fittings and an abundance of Carrara stone; it offered both a separate shower and a bathtub. The real selling point of the suite, however, was certainly the private terrace which was complete with a table and chairs for al fresco dining, as well as sun loungers and a parasol for relaxing and taking in some of the beautiful sunshine. The views were to die for, looking over the vineyard and the olive grove; this terrace offers pure escapism into Italy’s landscape. The vineyard truly is a focal point for this hotel. Creating stunningly crafted wines, this is authentic Italian living at its best. We thoroughly recommend having a tour of the winery along with a tasting session - it really is quite the experience, and one not to be missed. 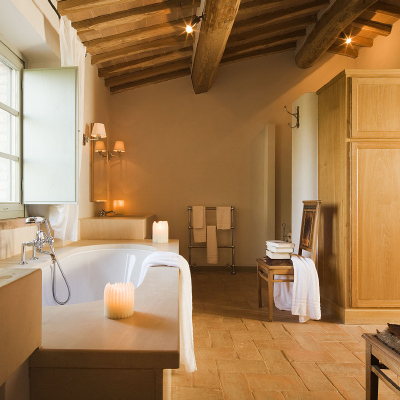 Although, we’re quite sure most will gravitate naturally to those activities whilst staying at Conti di San Bonifacio. It is hard to not want to explore. 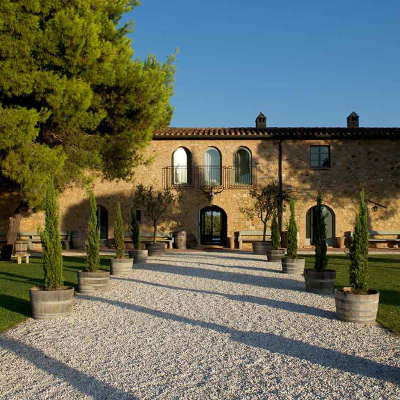 The winery isn’t the only facility Conti di San Bonifacio has to offer, however. If you’re looking for a bit of rest and relaxation, the hotel has an idyllic swimming pool, again offering wonderful views across the landscape. There are also plenty of other activities to keep you busy if you so wish, including an abundance of walking, or even hillside yoga. If you’re looking to have a meal or two during your stay, you won’t be disappointed. The Wine Library bar that can be found in the main Villa which is a real delight for a pre-dinner drink, and for the main event, Maremmana Restaurant offers some fantastic Tuscan cuisine. Using ingredients from the hotel’s Organic Garden, you can expect very locally sourced ingredients that support the sustainable farming and agriculture ethos of the local area. 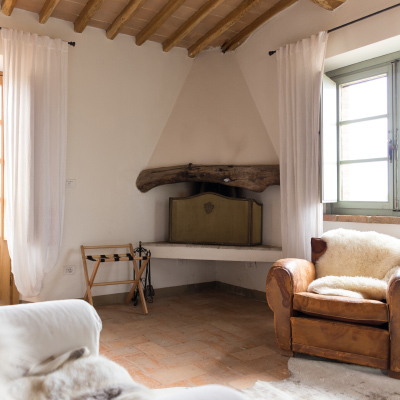 Overall we had a wonderfully relaxing stay at Conti di San Bonifacio. 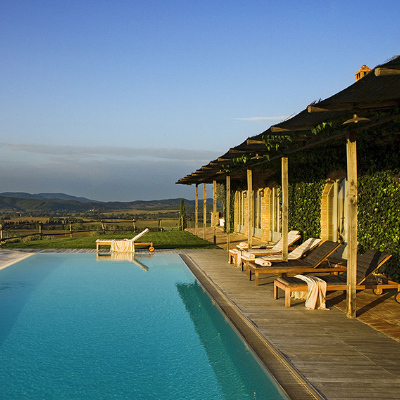 We highly recommend this hotel to anyone looking for the perfect Italian escape. The staff were incredibly friendly throughout, and we ended our stay feeling completely refreshed. It really was a true delight.